Recently, Did You Know Gaming? has shared with us some interesting trivia of the famous voice we all love and know as Mario, and his hopes to potentially voice Link. 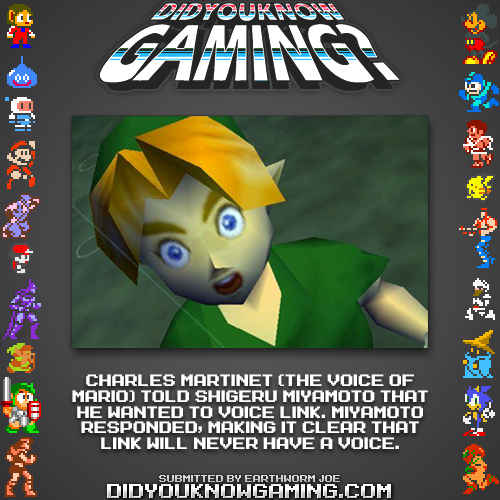 Voice actor Charles Martinet is widely known for voicing various characters within the Mario series ever since his first Mario debut in 1995. Who knows how he would have interpreted his voice to suit Link? Even though Link hardly speaks, with the exception of his signature variations of “Hay-yah!”, Miyamoto had made it a point that further dialect would not be necessary. Hit the jump for a better look! Link’s voice actors we are all familiar with in Ocarina of Time and other Zelda titles are voiced by, Nobuyuki Hiyama (adult Link), and Fujiko Takimoto (child Link). What would you think of Charles Martinet, had he been the voice of Link? Do you think it would sound funny? Or maybe since he is a skilled voice actor, he could have created an entirely different voice for Link and of his “Hay-yah!” sounds. Let us know in the comments below!